When I texted Erica for my first nutrition meeting I was beyond myself. I had just been asked to lose 10 lbs ASAP for a movie shoot. I am honestly in great shape and eat really well...how was I going to lose weight (and fast)?! Erica sat me down and went over everything. We laid out a food plan that was healthy and a workout plan that covered all my bases. And she checked in on my constantly. I honestly don't think I could have handled this pressure without her encouragement. She was always extremely positive and I think she was more excited for me than I was for myself when the shoot came around! Since then I have done several "Food and Fitness Challenges" with Erica, losing more than 8% body fat and gaining 2% muscle over a years time. She still checks in on me all the time too! I don't think I would be where I am in my acting career without Erica. Your body is your business in Hollywood and the competition is so fierce, not to be corny, but she really did give me an edge! 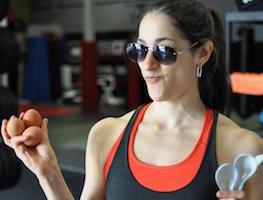 Just wanted to send a quick shout out to Erica Giovinazzo and her Food & Fitness Challenge!! I did the FFC in May and I loved it so much I kept doing it. It is now the way I live (plus CrossFit very regularly). It was slow going at first... in fact my actual weight has never changed (the same to the pound), BUT, I lost roughly 5% body fat since May and my before and after pictures are pretty awesome!! The change began that faithful day last December when you called me out for my shoddy attendance at BRICK. Little did you know that sparked something in me, and fueled a partial participating in the Jan 2014 FFC, an up-tick in attendance from once every 2-3 weeks to, at a minimum, 1-2 classes per week. My first competition followed suit in April 2013 where I placed in the top 10, then classes became a regular for me... At the end of the day, you were the catalyst in igniting my journey for a more fit lifestyle, and I will forever be indebted to you. Thanks for doing this and for all your tireless support. I can’t tell you how much I look forward to reading your posts and digesting all the info you give. It’s wonderful and super helpful and supportive! I’ve done challenges at my other box and I love this one so much more - I feel this challenge and “lifestyle” way of eating is much easier to do in real life... I feel better than I have ever and I owe it to you and your help.